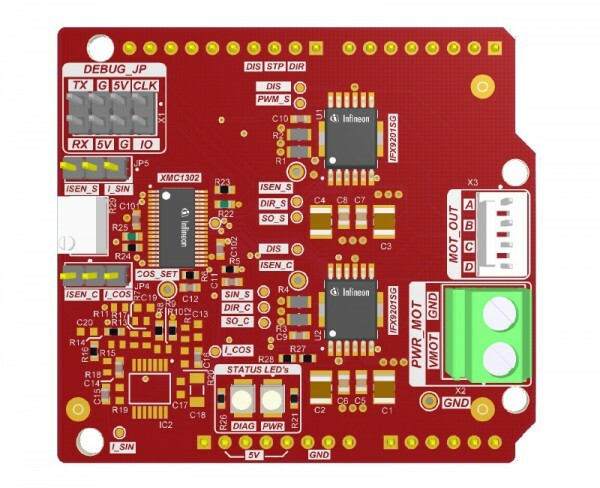 The stepper motor control shield from Infineon Technologies is one of the first high current stepper motor control boards being compatible to Arduino as well as to Infineon’s XMC1100 Boot Kit. The stepper motor control shield is capable to drive the two coils in a stepper motors featuring dual-half bridge configuration. The implemented integrated IFX9201 half bridges can be controlled by a STEP-signal via the STEP Pin. Interfacing to a microcontroller is made easy by the integrated XMC1300 microcontroller that holds the peripherals to allow high-speed current control. Microstepping of the stepper motor can be achieved using the internal comparators, operational amplifiers are installed to adapt the motor current sense signal to the microcontroller’s input levels.